According to the U.S. Food and Drug Administration, pineapples are free of fats and cholesterol. They’re also very low in sodium and high in vitamin C.
Pineapples contain bromelain, an enzyme that helps to reduce inflammation. Like all fruits high in vitamin C, pineapples can help boost the immune system and help prevent cancer. 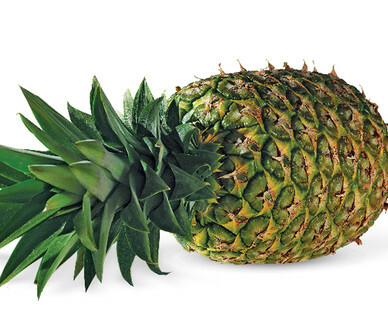 Pick pineapples that have green, fresh-looking leaves. When ripe, leaves should be easy to remove. They should be heavy and have a sweet pineapple aroma.